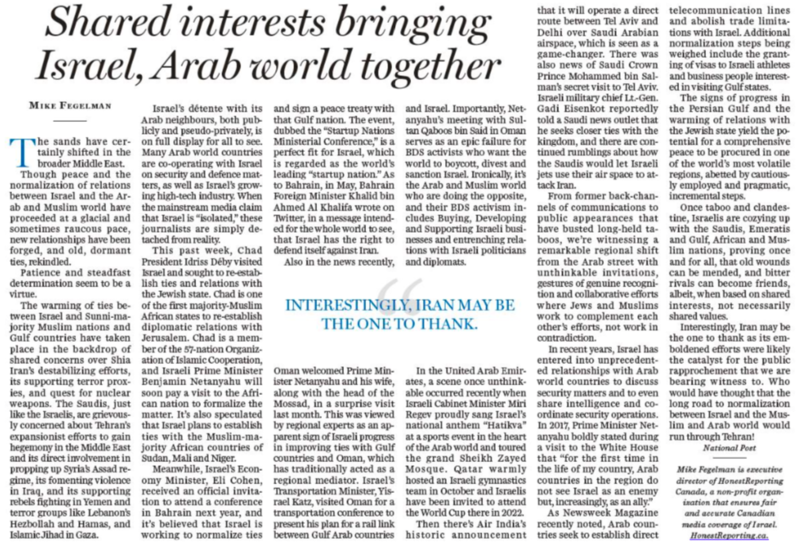 On December 1, the National Post prominently published an important op-ed by HonestReporting Canada Executive Director Mike Fegelman on the topic of the shifting sands in the Arab and Muslim world, where in the quest towards normalization and a comprehensive peace in the Middle East, Israel is being publicly embraced as an ally by many Arab and Muslim-majority countries. What was once unthinkable, taboo and even dangerous to talk about openly, we are witnessing history unfold as the Jewish state is welcomed by the broader Middle East as a legitimate and respected member of the community of nations. Read and share our op-ed to spread its impact. The warming of relations raises hopes for a comprehensive peace in one of the world’s most volatile regions.